to fund a program on opioid prescribing. I attended the SCOPE of PAIN program Friday November 6, from 8 to 12:30, taught by an Addictionologist from Portland with our local Southern California DEA. Continuing education credit was given by Boston University. The first grant recipient was in 2012. Could I be interpreting this wrong? Insurers simply deny paying for high doses. They have begun already. I am exhausted from ICD10 diagnosis coding – complex patients !!! – that has taken away any possibility I could leave my desk until 4 AM for the last four weeks, in midst of moving office to much better place, and midst the only two computer crashes I have ever had in my pursuit of efficient tech, plus dental fracture, so much more….perfect storm. The paragraphs could be edited and rearranged, so they would be in sequence but they’re not. I hope others will give me their take on this. It has been getting worse since almost all university interdisciplinary pain clinics were closed in 1991. Insurers, i.e. managed care clerks, are practicing medicine mandates set forth by anonymous committees looking at spreadsheets not at our complex care. Insurers could save many billions if they invested a few billions in education. Insurers wrote Obamacare. They could write it better. Congress wants all of us to do our part. Surely business too? Based on this series of opioid conferences, my guess is their first step is to chop opioid prescribing down to 100 mg morphine equivalents. But what about untreated pain at the heart of the epidemic of suicide? I see it among all classes of people, because we’ve focused on opioids too long to the exclusion of research and exclusion of a whole world of medications now generic, no longer on patent therefore inexpensive, FDA approved medications. The biggest shock: Valuable compounded medications are no longer on formularies of insurers! Our most affordable FDA approved medicines are no longer covered by insurance. Where is the data that we must limit the dose to 100 mg per day morphine equivalent? Is it too much pain medicine or is it untreated pain? Is it lack of medical care? or is it lack of affordable medical care? My comments arise from grave concern the Insurers and FDA are overlooking the needs of my pain patients. I must speak up now despite need to recover in the next few days. in this multimillion dollar pharmaceutical-company-funded opioid conference? FDA mandated that manufacturers of extended release opioids fund the conferences. rather than just opioid management? We need more than just studies of suicides and opioid changes. to recognize legitimate therapies that work for real people. go down if people could get treatment for their pain? I posted this week on a new study, an epidemic of suicide in Caucasian middle aged Americans. The results were a shock to Case and Deacon, the Princeton Economists who did the research that merited two articles in the New York Times. driven by pain, disability, loss of job, drug abuse, other. By too many opioids or by untreated pain? 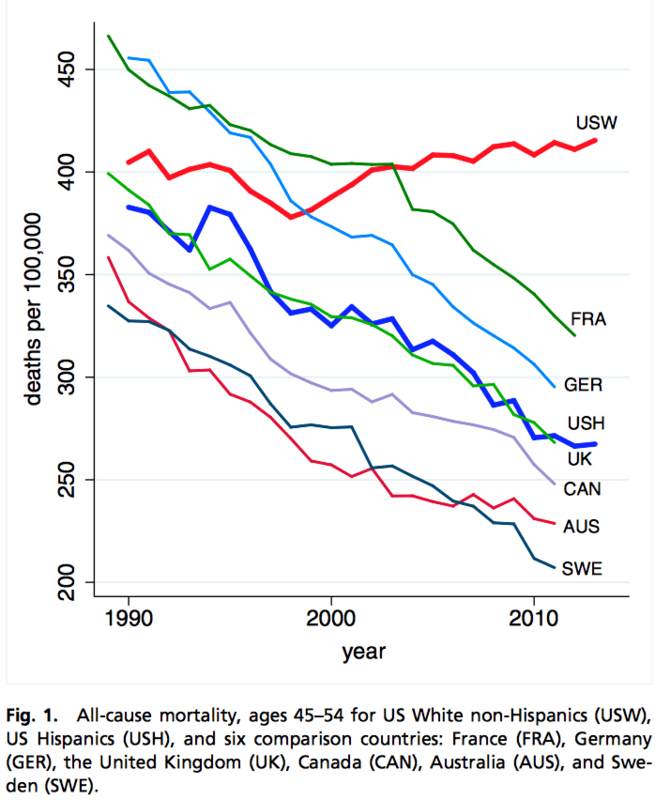 That is why, a few days ago I posted on that epic study by Princeton economists: the suicides in middle aged Caucasians now comparable to deaths during the AIDS epidemic. I posted how that can change. In that article and for years with this blog, I post about medications that work more effectively than opioids, i.e. glial modulators, and the need for compounded and herbal medications from approved highly reputable small local pharmacies need to be covered by insurers and allowed on hospital formularies. not due to an epidemic of opioids? 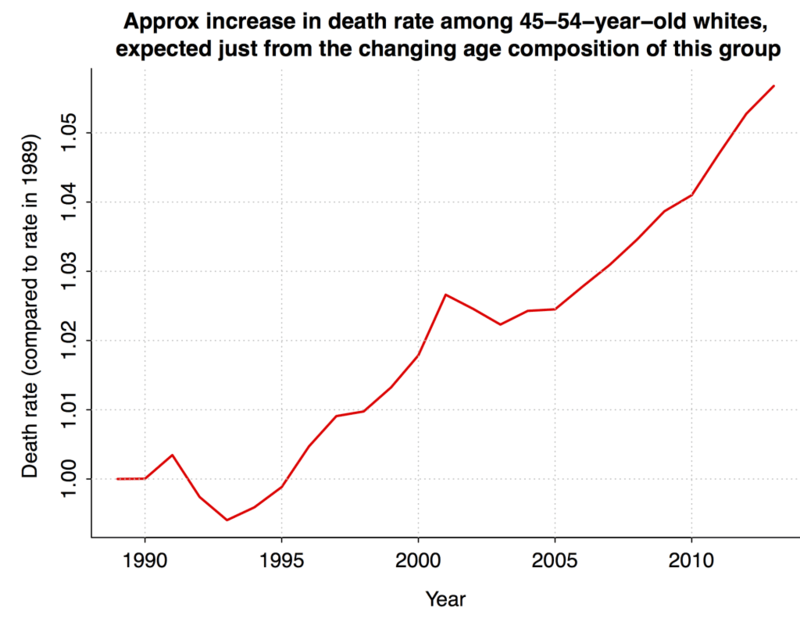 The key figure from the Case-Deaton study on epidemic of suicides in white middle-aged Americans – bigger than deaths at the height of the AIDS epidemic. The question is why? Regardless of the argument, untreated pain is a big problem. It causes suffering and joblessness, and can lead to addiction and suicide. Does it matter which side of the argument is right? Pain management is being taught in only 3% of American medical schools. Does this lead to suicide? Money is the root of some of this. The cure for suicide is not just to take a sword and slice off the top doses of morphine, and treat everyone with the same low doses, whether you have herniated discs or sprained ankle or RSD. Sprained ankles may be already getting too much. Why blame it all on over-prescribing? How about suicide due to under-prescribing, or suicide from not treating pain at all because healthcare insurance and unemployment don’t mix? Are they blaming high doses as cause of suicide? How about when high dose opioids fail, when all drugs fail, we see no new drugs on the horizon for pain control. That does not fill those patients with hope. Of course it is important to acknowledge, as the New York Time health section has followed that epidemic research with How Doctors Helped Drive the Addiction Crisis. Someone must advocate for change. It’s not just pills, it’s not just opioids. on opioid treatment of pain. AND we need access to compounded drugs, herbs & supplements in our hospitals. If Memorial Sloan Kettering Cancer Center can do it, why can’t my hospital? Expect 100 mg oral morphine or equivalent maximum dose per day to rapidly become the standard nationwide. Insurers are refusing to cover the cost of higher doses. Even if you can afford $17,000 out of pocket each month for pain relief, your doctor will be shouldering liability if outside these rapidly evolving guidelines. Insurers rule – and they deny coverage of inexpensive compounded drugs that work better than opioids for my patients who have failed all known treatment. That’s why we need better education and more clinically focused research. Those who blame Obamacare for high insurance costs and business-wide practices need look no further than the price of medications, especially opioids. It seems everyone breezes over where Washington State came up with a maximum of 100 mg morphine (or equivalent) as a maximum daily dose of opioid. This 100 mg maximum daily morphine dose became law in Washington State many years ago, initially for Workers Compensation, and will soon be adopted by Oregon. But opioids are still necessary for some. Those of my patients who take opioids will have a very hard time with the 100 mg morphine (or equivalent) maximum daily guideline. Informed consent is out the window. We all recognize the practice of medicine has been done by insurance companies since the late 1980’s when managed care took over. This will not change. Now insurers require the ICD10 diagnosis code before they will allow the pharmacist to refill an antidepressant that the patient has been taking for one year with much needed relief. This will give them more tools to deny paying. It would appear that those who govern our medication use (insurers and DEA) — and who deny coverage of even more useful, inexpensive medication – feel that 100 mg morphine equivalent is the maximum dose that should be prescribed. Only 3% of medical schools teach pain management. That ignorance is costing us trillions in insurance and pharmaceutical fees, and right now the latter two are making war on each other by taking it out on you, the patient who is getting substandard care. They’re taking care of their financial needs that show us the symptoms of disease, pain, suffering, disability, loss of job, and the just published this week, the epidemic of suicide. We need to treat the cause, not just the symptoms. Medical education, injury prevention and treatment needs to be taught starting K-12. The cost would pay for itself but the Insurance Industry needs to pay for it there and in University Medical Schools because Congress will not pay for it. It would be a cost saving investment that would pay itself off in care for seniors when grandchildren have to spot mom and dad in the 24 hour, extended family care that strains budgets. We cannot afford not to teach trigger point basics to each kid and each physical therapist and MD. That alone could save tons of opioids and monthly visits for what never works for muscle strain that no one has found. I’m tired of seeing how degraded it has become. To fail to treat the cause of disability and suffering is far more in our hands now, it could happen if people were taught basics instead of opioids, K through medical school. Are we teaching only opioids? yes, it seems so. I am advocating for everything I have written about in this blog since 2009. Glial modulators, mechanical approaches, but compounded medications, in particular, are sadly becoming unaffordable because insurers have stopped coverage for them. Then we all lose one of the most important tools, the only tool, that my patients and millions of others have in treating intractable pain or treatment resistant Major Depressive Disorder, Bipolar Depression. Compounded medications often work after everything else has failed. The lives of my patients have usually either returned back to normal or improved in ability to function. That has never been shown with opioids for chronic pain. I’m too exhausted to be in a position to edit what I’ve written just now, or write adequately. I am just furious at the direction our country for decades has pushed into opioid treatment rather than pain management. This has reached peak brewing since the DEA conference yesterday, dictated by the FDA funded by opioid manufacturers. It is a hope that Insurers could fund an analysis of the billions that could be saved and suicides prevented if they funded pain management. What is there to live for than a life free of pain and disability? The analysis could show how much is saved when training begins with the young, how to prevent and treat injury. How helpful a child can be to aging grandparents or parents when illness strikes the family. We always turn to family first, as we should. Why is something of the field of pain management not taught in K-12? The FDA just authorized two opioids for children this last week. I have a vague memory one was oxycontin in children. I do not argue against opioids, I have given opioids to tiny children when I worked in hospice. Children have crippling arthritis too and other medical needs for opioids. I am not arguing against opioids. I am saying that what is taught is zero pain management. The focus on drugs is completely unbalanced. If Sloan Kettering can teach herbal and supplementary medicine to cancer patients, why not begin the study of herbal medicine at K-12 since a lot of parents are taking it instead of using common sense such as exercise, weight loss, family time, relaxation. And herbal and supplementary medicine is what these young ones will teach their children when they grow up. Hopefully prevent some of the toxicity from swallowing all sorts of useless and dangerous things on the shelves. Rational health care must begin young in the schools. .
Have you received IV Pamidronate or other IV bisphosphonate for pain?